Join us Saturday for a great concert at FPC Elizabethton. We are bound and determined to save Tennessee's mountains. Do get the word out about this concert! If you can, come early and join our afternoon of action. 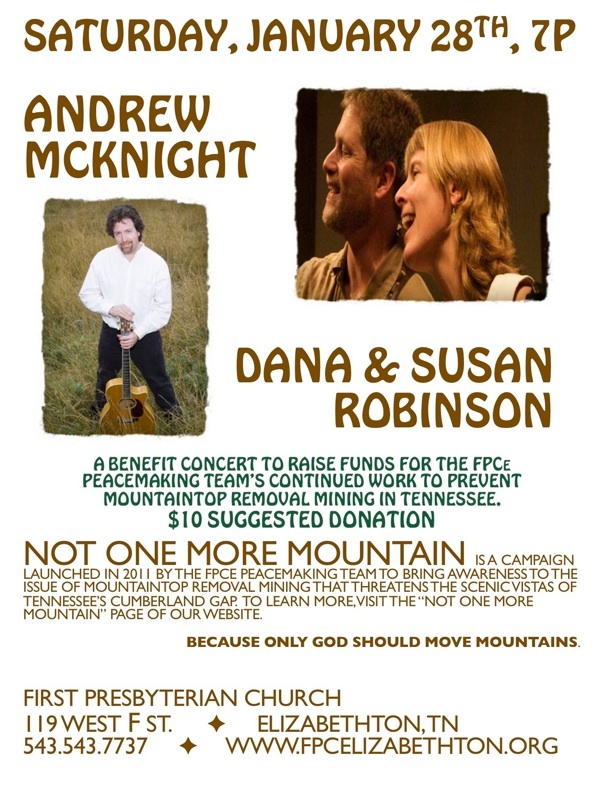 At 4 p.m. our Peacemaking Team will host an afternoon of action on behalf of our mountains. There will be discussion, action planning, letter writing, and phone calls to Tennessee legislators' offices. Here is a packet with information about MTR and what we can do. Today, January 24th, is the day to call governor Haslam and ask that he show leadership in the effort to end Mountaintop Removal Mining in Tennessee. Ask him to support legislative efforts to pass the Tennessee Scenic Vistas Protection Act. Here is my interview with Jennie Young about preventing MTR.